If you are in need of Morgan Hill copper repipe service, then contact the Gladiator Repipe team for fast, affordable repiping services. Ask the Gladiator Repiping team for their expertise when replacing all the pipes in your home. Call us at 408-649-7290 today for a free estimate. Or stop by our storefront location at 541 W Capitol Expy Ste 10-223, San Jose, CA to speak with one of our skilled team members. We have performed copper repipe in Morgan Hill for the past several years. We are committed to delivering excellent service. We are committed to making sure that everyone gets excellent service. We will thoroughly inspect your pipes. After, we will determine whether copper pipe replacement in Morgan Hill is necessary. The problem may be able to get fixed, which will allow your pipes to last for a longer period of time. 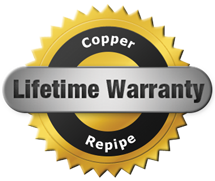 There are many signs that you may need copper repipe in Morgan Hill. You may notice that your water is discolored. Rust has a tendency to build up inside of old pipes. That is why this rust can end up inside of your water. You may also notice decreased water pressure if a copper repipe is needed. The low water pressure can be caused by a leak in your pipe. If the pipe is leaking, then it will continue to worsen unless it is fixed. A clog can also cause the water pressure to decrease. Additionally, an abnormally-high water bill is a sign that you need to get Morgan Hill repipe. A leak can cause your water bill to increase. Hiring Morgan Hill copper repipe plumbers can be quite expensive. However, it is worth the money. In fact, you will be able to save money if you get new pipes. You will be a lot less likely to have plumbing issues if have new pipes in your home. New pipes can last a long time. Many pipes can last over 50 years. Additionally, getting new pipes can improve energy efficiency. They can improve more efficiency by retaining more heat in the water lines. New pipes are also more resistant to freezing, which can save you money and frustration in the winter time.